Ever eaten an insanely hot pepper and wondered just how spicy it is? Believe it or not, there is actually a standard unit for measuring levels of spiciness. That’s right, we’re talking about the Scoville Scale. Named after American pharmacologist, Wilbur Scoville, who devised the test and scale in 1912 while working at the Parke-Davis pharmaceutical, it measures the pungency of chili peppers and other spicy foods. The standard unit of measure being the SHU. SHU is a way of quantifying how spicy a pepper is by measuring the concentration of capsaicinoids. Capsaicin is the chemical responsible for the spicy sensation within a pepper. 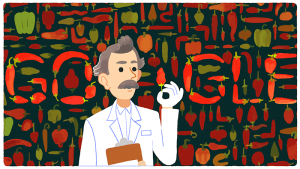 Google even commemorated Scoville on his 151st birthday with this homepage in 2016. The 7-Pot family is from Trinidad. There are a few different versions, including the Yellow 7-Pot, the 7-Pot Jonah, and the Chocolate, or 7-Pot Douglah. The name refers to the saying that it is hot enough to spice 7 pots of stew. In Trinidad, they are used in military grade tear gas and marine paint, which prevents barnacles. 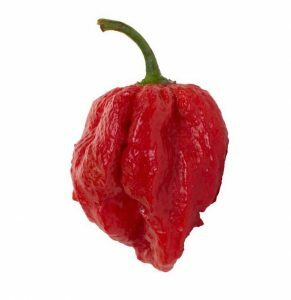 Coming in at number on this list is this 7 Pot variety, which comes from the region of Barrackpore on the Caribbean Island of Trinidad. It has a nice fruity flavor along with considerable heat. The Bhut jolokia, also known as ghost pepper, ghost chili and ghost jolokia, is an interspecific hybrid chili pepper cultivated in the Northeast Indian states of Arunachal Pradesh, Assam, Nagaland and Manipur. With over a million SHU, these peppers are hot. Think you can handle it? Try our very own Small Axe’s Ghost Peppers sauce for yourself. The Naga Viper was created in England by chili farmer Gerald Fowler of The Chili Pepper Company. 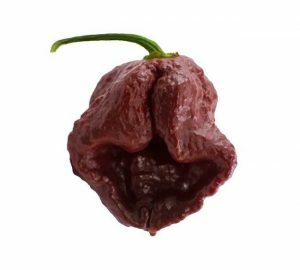 It is claimed to be an unstable three-way hybrid produced from the Naga Morich, the Bhut jolokia and the Trinidad scorpion, some of the world’s hottest peppers. 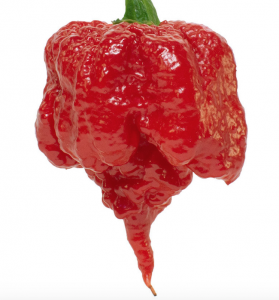 The Trinidad scorpion pepper is a Capsicum chinense cultivar that is among the most piquant peppers in the world. It is indigenous to Trinidad and Tobago but was cultivated in Butch Taylor in Crosby, Mississippi . It was named by Neil Smith from The Hippy Seed Company, after he got the seeds originally from Taylor who was responsible for propagating the pepper’s seeds. Yep, another from the 7 pop family. And it won’t be the last. 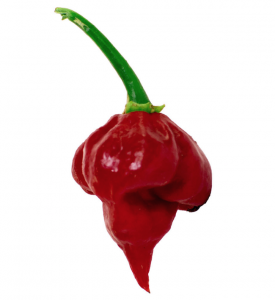 A cross between the Naga Morich and Trinidad 7 Pot, The 7 Pot Primo has a fruity/floral flavor. It is very rare pepper made from true primo seeds are hard to come by. Its defining characteristic must be its long skinny “tail”, which some peppers cultivators have tried to replicate because it looks more perilous than a stingray. As we told you, more to come from the 7 Pot family. But although the 7 Pot Douglah may be the last on this list, its certainly not the least. In fact, at nearly 2 million SHU its nearly twice as spicy as the Barrackpore. The Douglah has dark brown/deep purple skin, whose defining characteristic are the many “pimples” over the surface. The pepper starts out green and matures to the dark color uniuqe to the Douglah. When you slice a fresh one open, you will immediately see pools of liquid capsaicin oils that give this chili so much heat. That’s right, you can see the spiciness. 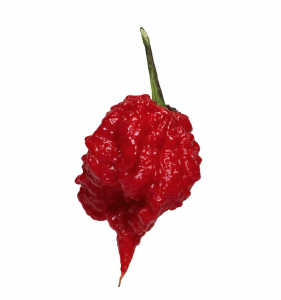 Coming in at number two is the Trinidad Moruga scorpion. This poignant pepper, like many others on this list, is native to Trinidad. 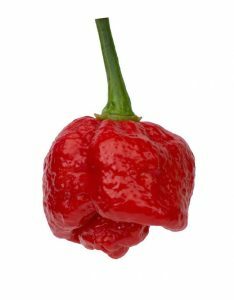 On February 13, 2012, New Mexico State University’s Chile Pepper Institute (The only international, non-profit organization devoted to education and research related to Capsicum, or chile peppers) identified the Trinidad Moruga scorpion as the hottest chili in the world, with a mean heat of more than 1.2 million Scoville heat units (SHUs) and individual plants with a heat of more than 2 million SHUs. “You take a bite. It doesn’t seem so bad, and then it builds and it builds and it builds. So it is quite nasty,” said Paul Bosland, a chili pepper expert and director of the Chile Pepper Institute. If you’re in New York, you don’t need to go too far to arrive at the home of the world’s hottest pepper. Punching in at number one, with an astound 2.2 million SHU is none other than the Carolina Reaper. Bred by ‘Smokin’ Ed Currie, proprietor of the PuckerButt Pepper Company in Fort Mill, the Carolina Reaper was certified as the world’s hottest chili pepper by the Guinness World Records on 11 August 2017. 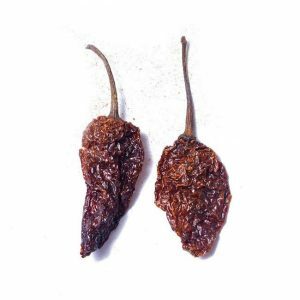 The crossbreed is between a “really nastily hot” La Soufriere pepper from the Caribbean island of St. Vincent and a Naga pepper from Pakistan, and is named ‘Reaper’ due to the shape of its tail. It has been described as having a fruity taste, with the initial bite being sweet and then immediately turning to “molten lava”… Now, that’s spicy! How much SHU can you handle? That’s all folks. Are you prepared to handle 2 million SHU of heat? Well, maybe you can ease into it with the Small Axe Pepper’s Spicy Three Pack. Perhaps its a good bench mark to see if you’re up for the Carolina Reaper?